Introduction: Boyle Heights Historical Society Advisory Board member Rudy Martinez is the author of this fascinating multi-part post on pianist/singer Hadda Brooks, who lived in Boyle Heights much of her life. We pick up the story with Hadda becoming a recognized local performer on the new Modern Music record label. An advertisement for Modern Music Distributing Company in 1945 touting Hadda Brooks as "Queen of the Boogie Woogie." From the website vocalgroupharmony.com. In quick succession other crowd-pleasing hits followed such as, “Rockin the Boogie,” “Riding the Boogie,” and “Bully Wully Boggie.” As label chief Jules Bihari later put it, “the first disc was a hit, and we were in the record business.” Right after Hadda's first hit, the Biharis hired a young man named Lester Sill to assist with sales, but he eventually worked his way up to produce many of Hadda's Modern recordings; in 1961 he and music producer Phil Spector would form the Philles Records label. 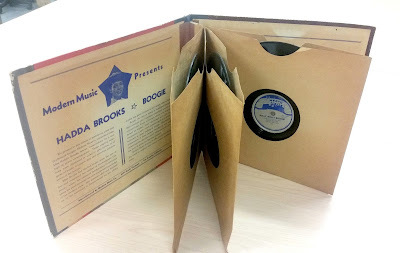 The 1946 "album" titled Hadda Brooks, Queen of the Boogie and featuring three 78-rpm discs, an unusual format of the time, especially for a black artist. Photo by Rudy Martinez. When I went into show business, my father almost disinherited me. He thought I was working on Central Avenue. My father had a freaking fit. My daddy sort of calmed down and he came to accept what was going on. When I first went to Central Avenue, it was really exciting. At that time, I was just getting away from home, and the whole atmosphere excited me. I was able to go see everybody without having to report back home. In mid-1946, Modern Music ambitiously issued its first “album” of 78-rpm discs. 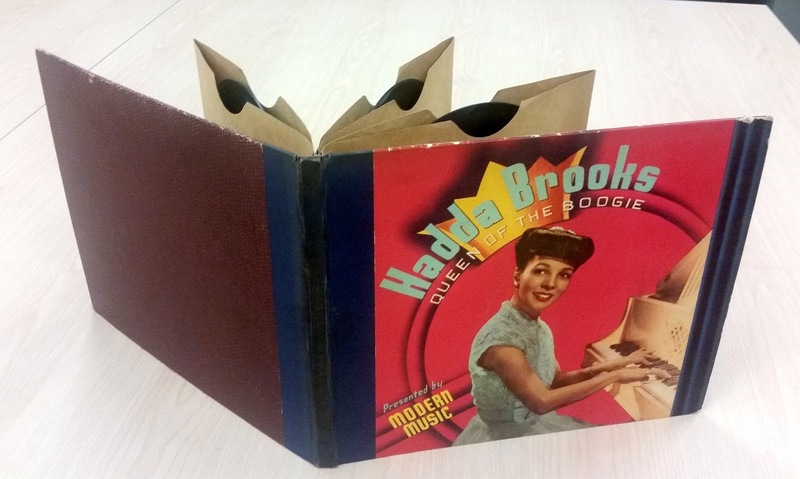 Simply titled, Hadda Brooks, Queen of the Boogie, it was a collection of three discs inside a flip-through album with her on the cover. The packaging wasn't unique in the record industry, but it was usually only distributed by the majors for established white artists. The inside of the gatefold of the Hadda Brooks album. Photo by Rudy Martinez. Hadda even made a promotional in-store appearance at the Good Housekeeping Shop in Van Nuys in June 1946. Like her previous releases, the album was a big seller for Modern Music. But, more significantly, the release had the distinction of very possibly making her the first black artist to release an album of 78s before the introduction of the long- playing (LP) format in 1948. 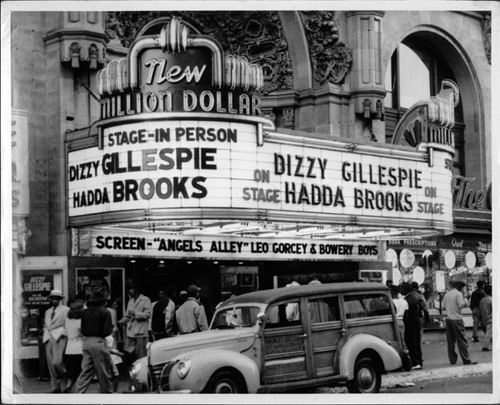 Around the same time as her album release, Hadda was attending a Lionel Hampton show at the Million Dollar Theater in downtown Los Angeles when he invited her on stage. Though she'd been recording for almost a year, she had not yet performed for a live audience. But playing with full confidence, the young and talented piano-playing sensation was an instant hit. Hadda received second billing beneath bop superstar, trumpeter Dizzy Gillespie, at the New Million Dollar Theatre in Los Angeles, 1947. From the Austin Young and Barry Pett Collection. That performance altered the direction of her career. In a short while, the "Queen of the Boogie" transformed into one of the most alluring and unique singers of her time. In early 1947, Hadda recorded her R&B hit and signature song, “That's My Desire.” A few months later, Mercury Records released white crooner Frankie Laine's version of the tune and it shot to number one in the broader pop market charts, making his rendition the more commonly-known today. Nevertheless, by 1947, Hadda was established as one of the most talented new singers around. Later that year, she went on an eight-month cross-country tour with Count Basie and Artie Shaw, which included some east coast dates and a performance at Harlem's famed Apollo Theater. With her talent, beauty, and air of sophistication, Hadda, was a natural for films and occasional fan-generated publicity. Over the next several years, she made cameos in a number of movies, such as the 10-minute short film, Boogie-Woogie Blues (1947), the all-black feature film musical, The Joint is Jumpin' (1948), Out of the Blue (1946) (with Hadda singing the title song), The Bad and the Beautiful (1952) starring Kirk Douglas and Lana Turner, and In a Lonely Place (1948) with Humphrey Bogart. She got the job in the latter when she was recommended for an audition by her friend Benny Goodman and beat-out Sarah Vaughn and Ella Fitzgerald! The cameos all consisted of Hadda performing as a piano-playing lounge singer. In addition, in 1947, Hadda was chosen by readers of the black-owned Los Angeles newspaper, The Sentinel, as one of the “10 Best Dressed Ladies” in the city. Meanwhile, the grosses from Hadda's popular recordings were still contributing significantly to the growth of Modern Music. In 1947 the Biharis relocated their operation from Little Tokyo to the Hollywood area. Their operations included a new and larger pressing plant, which is believed to have been the first modern, self-sufficient independent record pressing plant in the United States. As busy as Hadda was during the late Forties, she continued to maintain her connection to Boyle Heights. She volunteered as the club adviser for a Boyle Heights social and charitable group made up of black women from the area. Called The Social Heighters Club of Boyle Heights, it was formed in October 1947 according to the newspaper, The Sentinel. 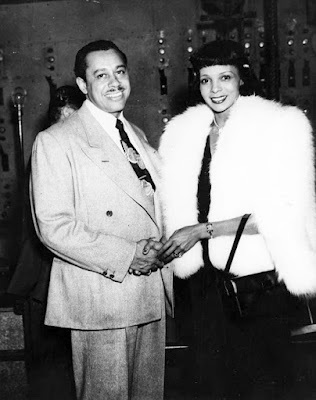 Hadda with the famed singer and bandleader Cab Calloway, 1945. From the Los Angeles Public Library Digital Photograph Collection. Joe soon had an assistant scout accompanying him on these trips, a 21-year old musician from Mississippi named Ike Turner. In 1953 Joe and Ike recorded a newly-signed little-known blues singer and guitarist named B. B. King for Modern's new RPM label. The song was “Three O’Clock Blues,” and, as a #1 record, it was King’s first breakout hit making him Modern's biggest recording star throughout the decade. The Biharis would continue to find and record such artists as Lowell Fulson and Jesse Belvin, who scored big with his signature hit, “Good Night My Love.” Tragically, Belvin died at the age of 27 in 1960, and is interred at Evergreen Cemetery in Boyle Heights. Hadda Brooks was one of the most prolific recording artists between 1945 – 1949. Modern Music eventually released about sixty of Hadda’s recordings, but she probably recorded over one hundred. Before a second nationwide recording strike hit on New Years Day in 1948, Jules Bihari required Hadda and a few other Modern artists to go into a studio to record a batch of songs every day during the last week of December 1947 so that they could release these during the recording ban. Since the strike lasted less then a year, most of these rushed recordings were never officially issued. Hadda's newfound musical style ran counter to much of the kind of music the Biharis were recording by the early 1950s. By then, the brothers created several subsidiary labels like RPM, Flair, and Kent to market music that favored an amplified blues sound or a more sax-driven R&B style (the 1953 Chuck Higgins tune, “Boyle Heights,” comes to mind), plus many of the lyrics to the songs were racier or more overtly sexual. Hadda on the left with actress Dorothy Dandridge, right, late 1940s. From the Walter L. Gordon Collection, Charles E. Young Research Library, University of California, Los Angeles. In addition, unlike Hadda’s comfortable middle-class Boyle Heights upbringing, with her genteel-mannered parents and classical music training, many of the new emerging black recording artists had grown-up with experiences of blatant racism and grinding poverty. Their more robust sound was what the Biharis focused on and this just was not a natural fit for Hadda's music. Disappointed by the lack of support, Hadda left the now newly-renamed Modern Records Company in 1950. An article in the September 3, 1949 issue of Billboard reported that she sued Modern Records for back royalties, as well as unfair charges against her earnings for disc pressing production. The Biharis countered by declaring all their business practices were within accepted industry standards and approved by the American Federation of Musicians. Modern's in-house accountant also concluded all royalties and fees owed to Hadda had been paid. Nothing else about the lawsuit was published, so its outcome is unknown. In 1994, Hadda told the interviewer for the Central Avenue Oral History Project that she never signed a contract, or received formal royalty payments for her compositions – though the label gave her sole credit. She was given a weekly cash “allowance,” that was not always forthcoming on a regular basis and, at times, she had to directly initiate a request for money from the company's finance manager. However, Hadda did describe the Biharis as generous, and she always had money to pay for her expenses. Presumably this financial arraignment immediately stopped when she left the label, even though Modern Records occasionally released recordings from her back catalog long after she left. The fourth and final post on the remarkable life and career of Hadda Brooks follows her journey from leaving Modern Records, including a stint on early local television, her move to and work in Australia, and her later years, which brought some belated recognition for her many talents. Check back for the conclusion to Rudy's excellent post. Hi Unknown, thanks for checking out the blog and post. You can find Hadda's music out there, so you might try that out, too. Thank you for taking the time to research Hadda Brooks. What an interesting life Ms. Brooks led. She was clearly smart, talented, and quite a beauty. It's a shame that Modern Records underpaid her.